You don’t need me to tell you that it’s been a particularly long, cold, hard winter. Everyone’s saying it, and when they do I nod and roll my eyes in agreement – but the truth is, this winter didn’t bother me very much. I was just grateful for some decent snow to play in (and grateful to not be pregnant this year so that I could play in the snow without worrying about falling). Also, when you have four young children, you’re not going anywhere anyway; being housebound by cold and snow is just like the rest of the year, only with a different view. All the same, when our oldest daughter’s spring vacation arrived in late April, I was really starting to feel the effects of not going anywhere. So I made plans to go somewhere: Boston. 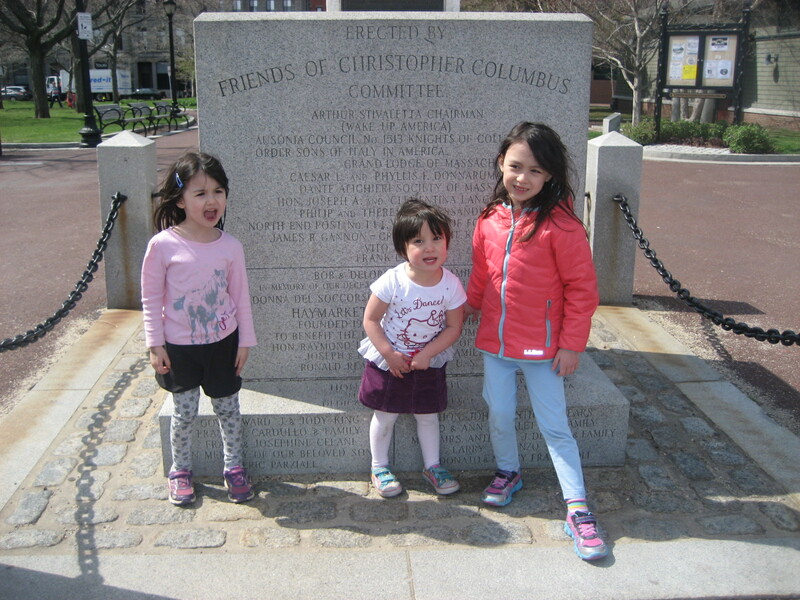 This would be our daughters’ first time in Boston, and our family’s first trip to a big city since the birth of our fourth child last June. We planned a quick, simple two-day, two-night stay. 1. Cities are expensive. My husband and I met, married, and lived our first few years of married life in New York City; we’ve known cities. But we’ve grown soft, and we were shocked by the expense of everything in Boston. Parking, food, museums – each of these cost our family of six over $100. Say what you will about the high taxes here in Vermont; we left Boston shaking our heads over how anybody – especially families – can afford to live in the city. 2. Cities are crowded. Again, my husband and I are no strangers to the hustle and bustle of cities. But it’s one thing to navigate congestion when you’re a single 20-something; it’s another thing entirely to navigate congestion with four small children. City kids probably learn this early, but in Boston we found that our own daughters have absolutely no sense of how to handle themselves in crowds. They stumbled around the sidewalks looking everywhere except straight ahead, they groped the legs of strangers and pushed past people in their way – in short, they behaved like tiny drunks. The large cushion of space that usually surrounds them in Vermont had shrunk to mere centimeters in Boston, and they hadn’t gotten the memo. 3. Cities require patience.We tend to think of city life as faster paced than country life, and in general this is true. But on our Boston trip, we observed that city life was marked by periods of frantic movement, interspersed with long periods of waiting. We had to wait in line to order food, and wait again until a table became available. We had to wait in line to buy tickets to visit the Boston Children’s Museum, and to board a Duck Tour (for which we’d already had to wait several hours, since all the previous tours were full). We had to wait for parking, for bathrooms, and to cross the street. All of this waiting was entirely new to our daughters, because in Vermont you rarely have to wait for any of these things. We explained to them (multiple times) that the people standing around were, in fact, a line, and we had to stay behind them. Our second daughter actually growled at the glowing orange hand that prevented us from crossing a busy street, until it turned into a white walking person. 4. Even a day in the big city doesn’t exhaust my children enough to make them sleep later. We packed a lot of activities into those two days in Boston. Every day was full, and every bedtime was extremely late. We loosened up on our regular schedule, because we were on “vacation time.” And in a departure from their usual tendency to party for an hour after lights-out, my daughters fell asleep the instant their heads hit the pillows. But both mornings, they bopped out of bed before 6:30 AM. Six-thirty is the time I usually have to pry them out of bed – on school mornings. 5. We didn’t really have to go anywhere.Without question, the highlight of this trip for my daughters was: the hotel. Our room was on the seventh floor, we took an elevator to reach it, and when they looked out the window at night they could see lights – none of which is a part of their day-to-day existence. Other delights abounded: the sliding mirrored closet doors, the bar soap in the bathroom (we use liquid soap at home), the cable TV in the bedroom, the indoor pool and hot tub, the Froot Loops at the continental breakfast. This made me wonder if we could’ve just driven ten minutes to the Marriott Courtyard in Middlebury and had the same amount of fun. Probably. But I’m still glad we went to Boston, and we’ll certainly go back – as soon as our bank account recovers. Faith Gong has worked as an elementary school teacher, a freelance photographer, and a nonprofit manager. Since moving to Addison County in 2011, her work has involved caring for a house in the woods, four young daughters, one anxiety-prone puppy — and writing for her blog, The Pickle Patch.